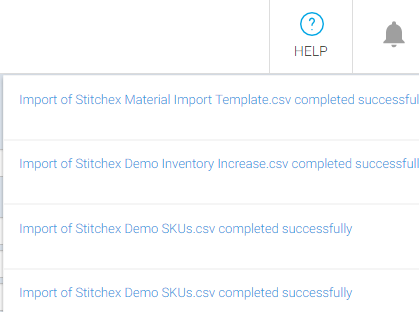 If you already have your data in another spreadsheet or database, you can import that data into Stitchex without having to manually create your products one-by-one. You'll notice a link to download a spreadsheet template. The spreadsheet template illustrates the exact structure required for your upload spreadsheet. Add your data to the template using the same structure and column headings provided in the template spreadsheet. (Don't change the column heading names). Once your data has been added, save your file to your usual location. Use The "Browse" button to locate your file (where you saved it). Stitchex will transform your existing spreadsheets into the same format with the same column headers before attempting to upload into Stitchex. Stitchex allows you to upload either a .xls or a .csv file format -- both are supported. Once uploaded, you will be taken to the Spreadsheet Import History Page where you can confirm whether your import completed successfully. From here, confirm the number of rows that completed were indeed the number of rows you imported. If you receive error messages, be sure you do not any rows with zeros. If so, delete them. And, make sure you are only using single letters for the weight_unit. Also check your variations URL links. Listed below are the Product spreadsheet import fields and their description. Also noted is whether these are "required" fields or not. If not a required field, feel free to leave them blank. If they are a required field, the data in that field cannot be left blank or the upload will fail. The unique product identifier. If a product exists with this identifier, it will be updated, otherwise a new product will be created. Required field. The season name. Required field. The product category name. If the category doesn't yet exist, a new category will be created. Required field. The description of the product that you eCommerce store. The description you want displayed on your line sheets for this product. Enter the tags for this product to facilitate searches. The comma-separated sizing system for this product. For example, "S, M, L, XL, XXL". Required field. Color that distinguishes this product variation. If your product has multiple variations in color of fabric, you will have one row for each variation in your spreadsheet with different values in this column. If your product doesn't have color/fabric variations, then you will have a single row (and you must still provide a value in this column). Required field. Wholesale price for specified channel for this product variation. For example, if you have a single channel named "Wholesale", with a US Dollar currency, then this column will be labelled "wholesale_price (Wholesale USD)". If you have multiple channels you may have multiple columns, one for each channel. MSRP (suggested retail price) for specified channel for this product variation. See above for column naming example. You may have several of these columns in your spreadsheet if you have multiple channels set up in you account. textile_content The textile content value for the product variation. Enter the weight for the product. Enter the unit of measure for the weight. Use "g" for gram instead of "gr" or your import will not work. US harmonized tariff code for the product variation. country_of_origin Two letter ISO code (e.g. GB, US, CN) that corresponds to the product variation's country of manufacturing origin. NOTE: Please use the country codes defined at https://www.nationsonline.org/oneworld/country_code_list.htm instead of spelling out the country. intrastat_code EU member state intrastat code for the product variation. Manufacturing cost for this product, in the manufacturer's currency. NOTE: Use the Currency Codes by Country as defined at https://www.iban.com/currency-codes. Manufacturer's currency. If this isn't an existing manufacturer, this is currency that will be used when setting up the new manufacturer company record. NOTE: Use the Currency Codes by Country as defined at https://www.iban.com/currency-codes. Name of manufacturer to associate with this variation. If no manufacturer company exists with this name, then a new manufacturer will be created. The material cost for this product. NOTE: Use the Currency Codes by Country as defined at https://www.iban.com/currency-codes. The link to an online image. Specify whether that image will be used as the product's cover image. True for yes and False for no.